268 pages | 14 B/W Illus. The use of sporting and other mega-events to bring about transformation of socially deprived areas of major cities is becoming an increasingly important part of the raison d'être for hosting such events, especially given the immense costs involved and the current economic climate. The tax-paying public increasingly has to be persuaded of the benefits, beyond the event itself, to spend the nation’s resources in this way. This edited book, written by international experts, critically explores these multiple facets of the Mega Event legacy looking at the various economic, environmental and social impacts and benefits in multiple continents. It considers topics such as volunteering, participation, economics, sponsorship, ethics and technology in relation to legacy. 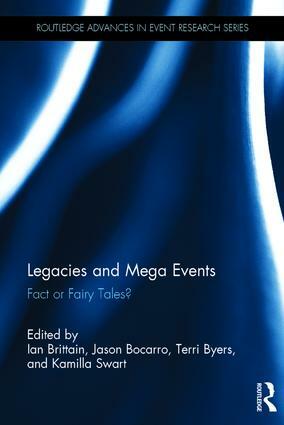 This timely book provides a further understanding of the legacy discourse, as well as the potential pitfalls connected to legacy in relation to mega events. Filling a gap in the literature on legacy research, Legacies and Mega Events will be of interest to events, sports, tourism, urban development students, researchers and academics. Terri Byers, University of New Brunswick, Canada. Sporting and Non-Sporting Mega Event Research: What next? Libby Carter, Coventry University, UK. Nick Passenger, University of Central Lancashire, UK. 13 The Legacy of the London 2012 Olympic Games: A Case Study of Grassroots Sport Clubs and the Sport Participation Legacy. resistance to social injustice and inequality. Ian Brittain is a Research Fellow in the Centre for Business in Society, Coventry University, UK. He is an internationally recognised expert in the study of disability and Paralympic sport. He is also the Heritage Advisor to the International Wheelchair and Amputee Sports Federation, who in a former guise founded the Paralympic Games, and he has attended every summer Paralympic Games since Sydney 2000. Dr Brittain has won and worked on research projects totalling over £1.3million. Jason Bocarro is a university faculty scholar and Alumni Distinguished Undergraduate Professor at North Carolina State University. His research focuses on examining how recreation and sport programmes and organisations can impact the health of children and adolescents. Dr Bocarro has published over 50 peer-reviewed research journal publications and been awarded over US$5 million of research funding to support his research. Terri Byers is an associate professor at University of New Brunswick, Canada. Her research focuses on community sport organisations, innovation and participation. She is widely published, active in consulting and teaching on sport and recreation management. Dr Byers has won and worked on research projects totalling over CA$2million. Kamilla Swart is a full professor in the College of Business Administration, American University in the Emirates. While at Cape Peninsula University of Technology, she served as the South African lead for Carnival. Her research interests include sport and event tourism, with a specific focus on mega-events and event policies, strategies and evaluations. She was instrumental in developing the 2010 FIFA World Cup Research Agenda and served as the City of Cape Town’s Research Coordinator for 2010. Dr Swart has published on varied topics relating to the bidding and impacts of mega-events, especially in developing contexts, and has won and worked on research projects totaling over ZAR25 million.